GOD SO LOVED THE WORLD THAT HE GAVE HIS ONLY SON . . . . 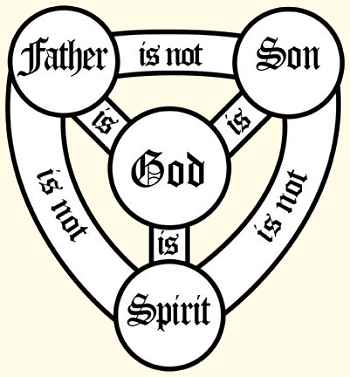 The Sunday after Pentecost is the Solemnity of the Most Holy Trinity - a celebration of the central mystery of our faith. It is a reality that is beyond our human understanding, yet is revealed to us by God himself. Father Gonyo's Pastor's Message this week is an excellent discussion of this blessed mystery. In our first reading (Exodus 34:4-6, 8-9), God reveals himself to Moses not only by name (LORD) but also by attributes (merciful and gracious, etc.). Early in the morning Moses went up Mount Sinai as the LORD had commanded him, taking along the two stone tablets. Having come down in a cloud, the LORD stood with Moses there and proclaimed his name, "LORD." Thus the LORD passed before him and cried out, "The LORD, the LORD, a merciful and gracious God, slow to anger and rich in kindness and fidelity." Moses at once bowed down to the ground in worship. Then he said, "If I find favor with you, O Lord, do come along in our company. This is indeed a stiff-necked people; yet pardon our wickedness and sins, and receive us as your own." In our Gospel reading, (John 3:16-18) we hear the well known passage of God's revelation of the gift of his only Son for the salvation of the world. In our Epistle reading (2 Corinthians 13:11-13), we hear the conclusion of St. Paul's letter to the Church in Corinth. Paul encourages us in how we are to live with one another. He then concludes his letter with a blessing in the most holy Trinity. Brothers and sisters, rejoice. Mend your ways, encourage one another, agree with one another, live in peace, and the God of love and peace will be with you. Greet one another with a holy kiss. All the holy ones greet you. The grace of the Lord Jesus Christ and the love of God and the fellowship of the Holy Spirit be with all of you.